The estimated population of nilgai in India is about 100,000. Wild populations also exist in the US states of Alabama, Florida, Mississippi, and Texas and the Mexican state of Tamaulipas, where they have escaped from private exotic ranches. The population around the Texas-Mexico border is estimated to be around 30,000, and the King Ranch, where nilgai were first released, now has around 10,000 of them. 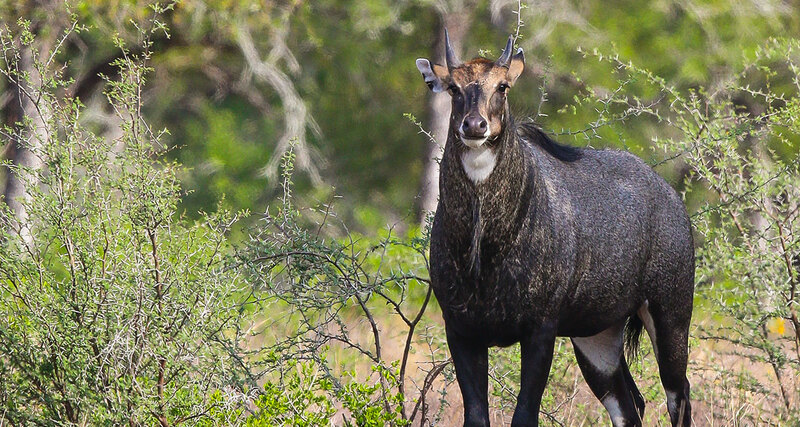 Like many Indian animals, nilgai are often victim to vehicular accidents, and their carcasses are often seen on major highways in northern India.The main threat to this species is the loss of habitat due to human population growth. However, nilgai are a crop menace, causing large-scale damages, especially along the Gangetic belt, especially in the Rohilkhand division of Uttar Pradesh.They have been declared as verminin in northern India, and they may be legally hunted after obtaining a permit. Nevertheless, the local belief that nilgai are cattle and hence sacred, has protected them against hunting.